When was the last time you spent some quality time with your dad? Over the years, when we gradually grow up, we create a world of our own. As a result, we tend to slightly get distanced from our parents, especially dad. We never discuss about our heart breaks and new relationships with Dad. This Father's day, break the ice and take your dad on a road trip! Here are few reasons why? Discover new things about each other! As we grow up, we tend to build a glass wall in between relationships. It's time to break the ice and start conversations that you never had. Talk to him about your relationships or your new crush! Ask him about his childhood or adulthood - A self-drive road trip will help you to know each other little better. Remember how he used to hold your hand and never let you go out of his sight. He still cares for you the way he used to. Give each other chance to recreate your childhood memories. We bet nothing is better than a road trip to rediscover each other. Be your dad's friend again! We find Dad's hobbies very uncool and outdated - Reading newspapers, books and politics etc. might not be something we can relate too. But it's amazing to share interests and learn new things from each other. After the road trip, you can be well informed about current political situation of the country and he may start listening to Ed Sheeran songs. No trip is complete without mouthwatering dishes. Introduce him to roadside dhabas and the mouthwatering platter they deliver. Discuss about authentic cuisines, fine dining and good old grub. He may not appreciate your unhealthy eating habits but nevertheless it's because he cares for you! The mix of road trip and nature helps to create stronger bonds! Home is the place where you grew up, so little bit of awkwardness is always there! A self drive road trip is always the best way to open up with your father. 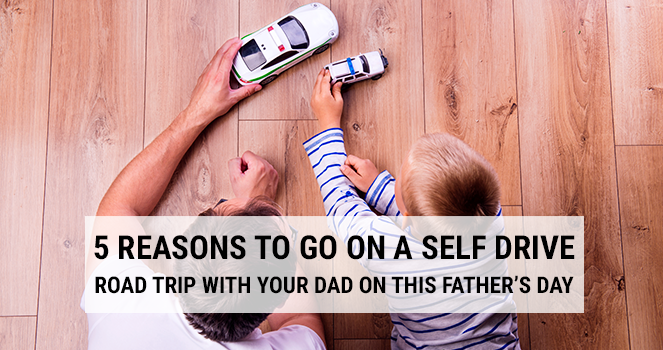 This Father's day, if you want to make your dad feel special, take him on a self drive road trip. All set to go a road trip with your Daddy dearest? Check out self-driving car rental options from Volercars. We provide you best price along with exciting deals. We ensure your safety and comfort, our cars are cleaned and serviced prior the trip and we have various pickup points around the city but you can still choose to get the car delivered at your doorstep. Opt for freedom and flexibility to drive a car of your choice.